If you don’t remember a Utah State football team ever starting a season 6-1, all is forgiven. You have to go all the way back to 1974 to find a USU team that opened in such torrid fashion. After dropping a 38-31 heartbreaker at Michigan State in their 2018 opener, the Aggies have caught fire and are on a six-game winning streak. They have beaten Air Force at home, and BYU and Wyoming on the road. They are scoring points by the boatload and they aren’t giving up many, either. The Aggies will put their streak on the line Saturday against the New Mexico Lobos (3-4, 1-2 MW). The Lobos are trending downward, having lost three of their last four. Still, Wells is anticipating a tough game. One of New Mexico’s biggest weapons is quarterback Sheriron Jones. He has amassed 1,087 passing yards on 77 of 137 completions with 13 touchdowns. Jones is also capable on the run game. He has 223 rushing yards on 52 attempts. Aggie senior linebacker Chase Christiansen knows containing Jones on runs will be a key to quelling his offensive prowess. But it’s not just Jones that Utah State is game planning for. With the Lobos having a new offensive coordinator this season in Calvin Magee, Utah State feels it will have to defend a more balanced attack — something the Aggies haven’t seen from the Lobos in some time. 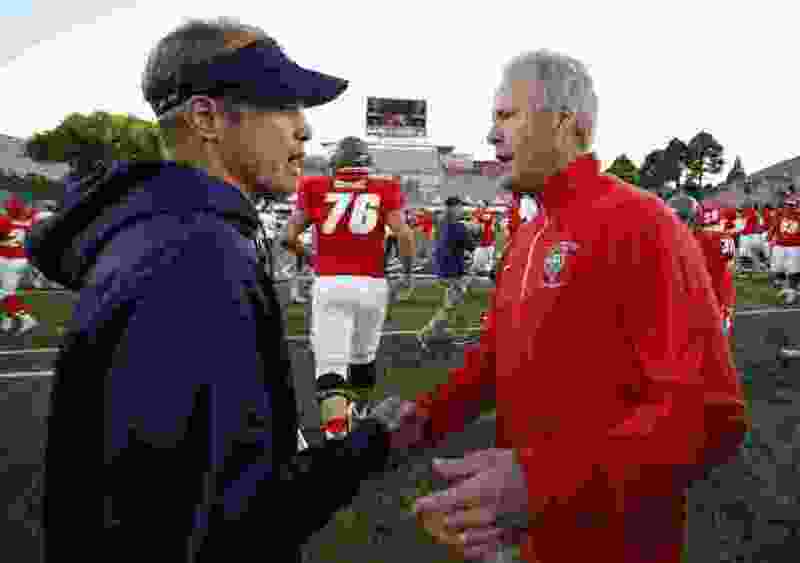 “They’re throwing it, they’re running it and the new offensive coordinator, Calvin Magee, is different from what they’ve been doing and what we’re accustomed to,” Wells said, adding that New Mexico’s offense features more options than in years past. The Aggies, however, have plenty of offensive firepower themselves. Quarterback Jordan Love has 1,610 passing yards and 14 touchdowns, while running back Darwin Thompson has nine touchdowns and 535 rushing yards so far this season. As a whole, Utah State is fourth in the nation in offense, scoring 47.7 points per game. It also has the second-most touchdowns that don’t come from offense. Part of the Aggies’ offensive output in recent years has been due to their offensive coordinator David Yost and how he’s implemented his philosophies. And the Aggies believe they still haven’t peaked. USU players expressed some disappointment in their most recent road win against Wyoming. Receiver Jalen Greene said the Aggies did not execute well on offense in that game. However, the fact that the Aggies were able to grit one out over the Cowboys in Laramie — after a series of blowout victories — was encouraging. Utah State’s season-opening run is starting to get some national attention. The Aggies rank tied for 27th in both the AP and coaches' polls. Kickoff » Saturday, 2 p.m.
About the Lobos » They are coming off a 38-7 home loss to Fresno State. … The Lobos have broken up 20 passes in the last four games. … The Lobos have attempted only three field goals all season, which is tied with Boston College for the fewest in the nation. … They are 13-11 all-time in games against Utah State. … New Mexico has rushed for more yards in seven of the previous nine meetings against the Aggies. About the Aggies » They are 3-2 against New Mexico under Wells. … Aggies have scored 43 touchdowns this season and only allowed 17. … Utah State became bowl eligible for the seventh time in the last eight years with its most recent win against Wyoming. … Undefeated at home this season (4-0). … Averaging 50.5 points and 453.7 yards per game during the six-game winning streak. … The Aggies have held New Mexico to less than 30 points in each of the last five meetings.